In case you missed it, we are thrilled to announce that m'bala is coming to O2 Fitness this December! This total-package 60-minute Group Fitness class will challenge you both mentally and physically and leave you feeling stronger than ever. We sat down with m'bala creator Melissa Baer to get the scoop on her motivation for creating m'bala and what to expect when you step into the studio. m’bala is a mind-body focused class that combines yoga, cardio, strength and mobility training. The class format is the same, however the movements and exercises change to keep your body guessing. Every class has a theme or a quote and begins with intention setting. If you want to feel strong, challenged, encouraged and motivated, this is the class for you! Why did you create this class? Growing up as 3 sport athlete and distance runner, I was constantly pushing my body to be better, stronger, faster. That led to injuries that eventually kept me out of the game, and left me discouraged. That’s when I found yoga and I fell in love. Once my body healed, I was trying to keep up with running, weight training and yoga, and found myself spending 3-4 hours a day trying to fit it all in. As an advertising professional that traveled a great deal of the time, this meant getting up at 4:00 and and then back at it after work as well. It was not healthy or sustainable, so I starting dreaming up a plan to fix that. After leaving the Design and Advertising world and getting my 200 yoga certification, personal training and fitness nutrition and group fitness certifications, I began practicing in my basement until I came up with the m’bala sequence. The thing that sets this class apart from others is the mind~body connection and the encouraging nature of the class. I believe people can do anything they set their minds to if they are reminded of their strengths and believe in themselves. It’s so much fun to teach and watch people accomplish what they never thought possible. The great thing about that it is translates into their daily lives and begins to change them for the better. What type of a class is m'bala? m’bala combines all of my favorite things about fitness! It has everything and is extremely effective for that reason. The music volume varies, depending on what segment you are working on. For example, the beginning and the end of the class is more yoga focused, so the volume is lower. The middle and bulk of the class the music is louder and used to motive students to push through the tough segments. Music has always been a huge part of my life so all of my instructors spend a great amount of time putting together the perfect mix for their classes! What can a first-time m'bala student expect when coming to class? I don’t think I’ve talked to a first time client that didn’t say “Wow, that was one of the hardest classes I’ve ever taken" followed by "but I loved it and can’t wait to come back." This is why it’s so important to me that every instructor pay special attention to encourage and even “coach” during class. For every m’bala class, you’ll need to bring a mat and wear yoga-like clothes or just anything you’re used to sweating “comfortably" in (ha!). What are the physical and/or mental benefits of the m'bala workout? Every m’bala class works every muscle group, although the movements and exercises change to keep it exciting and effective. It will definitely give people the calorie burn they are looking for, but it’s often the mental benefits that keep them coming back. Because of the difficult nature of the class, students begin to see their true potential and that begins to work its way into their daily lives, helps with relationships, jobs, etc. This class really is the total package! How often should someone do m'bala to see results? For beginners, I’d recommend 2-3 times per week and then build from there. 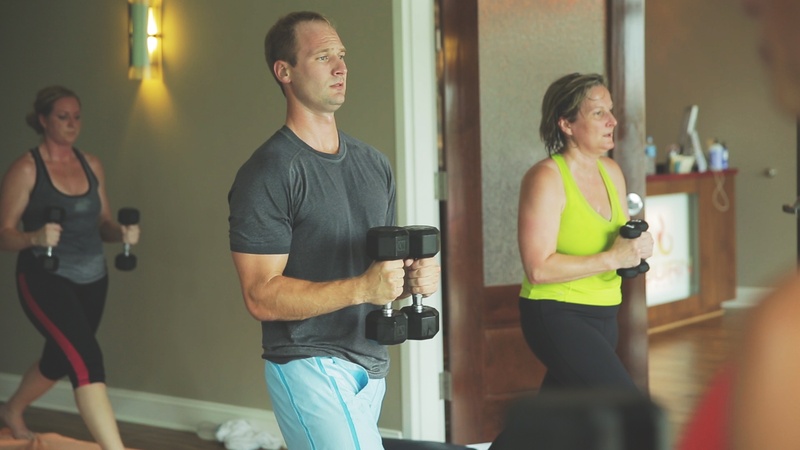 Even though you are working every muscle group during every class, there are several different ways that we sculpt to maximize results. There are many ways to modify depending on fitness levels, and instructors are trained to offer those modifications during classes. I’m constantly telling my clients to listen to their bodies, and to take breaks when needed. As long as they are giving their best for that day, that is ALWAYS enough. What is the equipment that is used in m’bala? We use light and medium hand weights and on occasion we also use yoga blocks. Some classes are more bodyweight focused, while others focus more on weight training. What do you like the most about m’bala? The thing that I love most about m’bala is the variety of people that take it. I’ve had everyone from college and professional athletes, to men and women in their 50's and 60’s. My mom takes the class and will be 60 next month! m’bala was designed for everybody! O2 Fitness is thrilled to partner with Melissa to bring m'bala to a club near you, starting with the brand new O2 Fitness Brier Creek. Subscribe below to stay tuned for details on where and when this class will be offered.